Non-Koreans who are accustomed to living in Korea can still experience difficulties when they face natural disasters, such as typhoons or heavy snow, or suffer unexpected mishaps, like fires or car crashes. As the number of non-Korean residents grows due to both international marriage and the increase of immigrant workers, there is a growing need to provide information about disaster management to non-Korean speakers. A new safety information app can help solve such difficulties. The app, Safety First, developed by the National Disaster Management Institute (NDMI), provides information about general day-to-day safety, seasonal safety, emergency calls, shelters and first aid kits. Information is provided in English, Japanese, traditional and simplified Chinese and Vietnamese. (From left) The Safety First app provides information about general day-to-day safety, seasonal safety, shelters, emergency calls and first aid kits. In the second picture, the app explains how to deal with a car accident. In the third picture, the app lets you know about some necessary medicine that houses should to keep in their first aid kit. 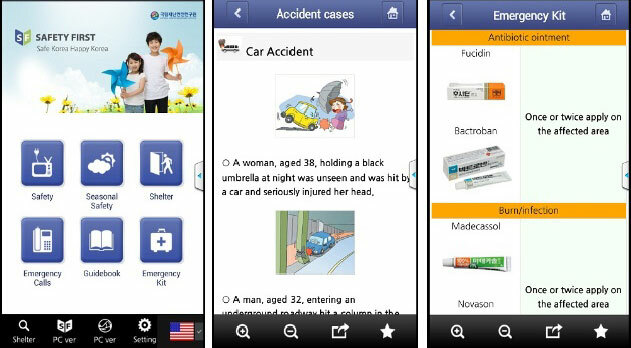 In the first section, the app informs people what to do in the case of a day-to-day accident, such as a fire, a car accident, a hiking accident or a steep fall. In the seasonal safety section, it talks about heat waves, typhoons, cold snaps and other seasonal weather-related safety concerns and informs people how to cope with them. The app explains about shelters and where people can stay in case of emergency. There are phone numbers for organizations that provide interpreting services for non-Korean speakers. It also has information about emergencies that can happen to the elderly, to women or to children, and provides advice with related pictures. The app is available to any smartphone user. You can search for “Safety First” in either the Google Play store or Apple’s App Store. The app is ranked 16th in the Google Play store and 3rd in the App Store. People can also scan the QR code on the brochure about the app to download the program. To download the Safety First app, scan the QR code above or search for “Safety First” in the Google Play store or in Apple’s App Store.